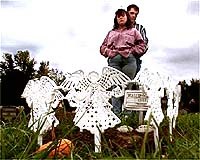 Tina and Jeffrey A. Englebrick of Shawnee, Kan., mourn their 3-month-old son, Scott, who died in 1997 after taking the heartburn drug Propulsid. The FDA "took my kid as a guinea pig to see if it would work," Jeffrey Englebrick says. In mid-1993, FDA officials prepared to approve Propulsid, a drug that eased nighttime heartburn. But a sign of danger loomed. FDA medical officer Andre Dubois noted that 48 of 1,993, or 2.4%, of the patients who took Propulsid in U.S. studies experienced "heart rate and rhythm disorders." In addition, eight children age 6 or younger who were given Propulsid had died. Dubois found that the drug's chemical makeup could disturb cardiac function. But he agreed with drug maker Janssen Pharmaceutica, a Johnson & Johnson Co. subsidiary, that the deaths in the studies were attributable to other causes. He recommended approval along with disclosure in the label of potential cardiac effects. "The risk seems very low," he said. Dubois, however, worked in a division that focuses on drugs for the gastrointestinal tract. No one at the FDA consulted with the agency's division of cardiac specialists before approving Propulsid on July 29, 1993, according to physicians familiar with the matter. By not tapping their expertise, FDA officials failed to notice what should have been another warning flag: Electrocardiograms showed that Propulsid prolonged patients' "QT interval," the time during which the heart's main pumping chambers contract and then relax. If the QT interval--typically about 4/10 of a second--is extended even slightly, it can trigger a disruption or cessation of the heartbeat. Called an arrhythmia, it can result in sudden death. FDA officials outside the gastrointestinal division had already warned publicly--on June 11, 1990--that two allergy drugs, Seldane and Hismanal, prolonged the QT interval and therefore posed lethal risk. Both drugs were later withdrawn. Indeed, the danger had been stressed for several years by Dr. Raymond J. Lipicky, director of the agency's cardiology division. Lipicky, writing in the August 1993 issue of the American Journal of Cardiology, said if a drug that prolonged the QT interval had a benefit that was "less than lifesaving . . . any risk of death would likely be considered unacceptable." "Those of us here at the FDA who are aware of your loss wish to again extend our deepest sympathy and sincere condolences to you and your family."  FDA Administrator Florence Houn, writing July 27, 2000, to the mother of 9-month-old Gage E. Stevens, who died on Thanksgiving 1999. In approving Propulsid, the FDA agreed to labeling that advised doctors of "rare cases" of increased heartbeats. The labeling said Propulsid's role in the events "was not clear." In response to written questions, Dr. Janet Woodcock, director of the FDA's drug review center, said the danger associated with non-cardiac drugs that prolonged the QT interval "was not well appreciated" at the time Propulsid was approved. Consequently, she said, this "was not identified as a concern" by the gastrointestinal division. By early 1995, Propulsid's danger to the heart was certainly identified as a concern within the gastrointestinal division, agency records show. On Jan. 25, 1995, a senior FDA medical officer, Dr. Stephen B. Fredd, told Janssen executives that recent adverse-reaction reports showed their drug was prolonging the QT interval, perhaps resulting in deaths. According to the meeting summary, "It was the firm's position that the cases cited by Dr. Fredd were not 'clean' cases, thus making it difficult to attribute the effect to [Propulsid]." Fredd responded that "unequivocal evidence" of Propulsid's culpability was unlikely to be captured outside of a controlled clinical study. But within a month, the FDA and the company agreed to the first of five safety-labeling changes that would help keep the drug on the market over the next five years. Meanwhile, a significant market for Propulsid emerged in the treatment of children. Propulsid was never proved effective or safe for infants, yet it became the drug of choice for many pediatricians in treating gastric reflux, a common disorder that is usually outgrown by age 1. Reflux can impede infants' digestion and, due to their crying, disrupt their parents' sleep. As with almost all drugs, doctors could lawfully prescribe Propulsid for any use, or "indication," they chose. On Aug. 15, 1996, the FDA informed the Johnson & Johnson subsidiary that Propulsid was "not approvable" for children, interviews and documents obtained by The Times show. The rejection, in keeping with FDA practice, was not made public. Gretchen Stewart holds her son, Gage Stevens, who was 9 months old when he died after being given Propulsid as part of a pediatric study. The county coroner concluded that Propulsid was a factor in his death. In private correspondence a year later, on Aug. 19, 1997, Dr. Lilia Talarico, FDA's gastrointestinal drugs division director, cited "at least" three recently reported deaths among child patients. She told a company official the agency was considering altering the label of Propulsid to "contraindicate," or to warn against its use in infants. Asked why the FDA did not immediately inform doctors and patients of the deaths, Woodcock told The Times: "Labeling changes [advising of infant deaths] were requested by FDA in August of 1997 but were not agreed to by the company until June of 1998." That revised label did acknowledge "several pediatric deaths" but left physicians guessing whether Propulsid was the culprit, saying, "Causality has not been established." Parents of children who died after taking Propulsid said in interviews that they had no inkling of danger. 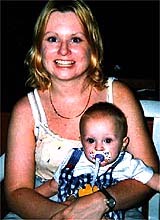 "If I had known that this drug caused cardiac arrhythmias, I would never have given it to him," said Tina Englebrick, the mother of 3-month-old Scott, who died in October 1997. The Kansas health department identified Scott's cause of death as sudden infant death syndrome. Had the parents of Gage Stevens, the deceased 9-month-old, "been informed of a risk of sudden death, they would not have administered the medication to their son," according to a lawsuit they filed in a Pennsylvania court on Sept. 10 against the manufacturer and the doctor and hospital who treated him. Gage, who had reflux, was given Propulsid within a pediatric study that was approved by the FDA and performed by researchers at the University of Pittsburgh. He died at 6:30 a.m. on Thanksgiving 1999. The county coroner concluded that the death was "directly related" to Propulsid and one other drug administered to the child. The coroner said Gage "most probably" had died after suffering a cardiac arrhythmia. Said Dr. Robert R. Fenichel, who retired this year as deputy director of the FDA's cardiac drugs division: "It was scandalous that all of these kids were being treated with [Propulsid]" in the absence of proven safety and effectiveness. On March 23, 2000, the FDA announced that Propulsid would be taken off the market as of July as a normally prescribed drug because of scores of confirmed heart-rhythm deaths. Overall, Propulsid has been cited as a suspect in 302 deaths. FDA administrators now concede that the agency failed to contain Propulsid's fatal risk. "We've had a seven-year history with this drug where it's a very rich opportunity for us to learn," the FDA's Dr. Florence Houn told drug industry officials in a Webcast on June 22. "One of the things we have learned is the approved indication for a drug really needs to [justify] the serious and life-threatening" side effects. In comments the same month to an FDA advisory committee, Houn added, "The labeling probably was not effective." Why did the agency wait so long to seek the withdrawal of this drug for nighttime heartburn in adults? "We simply tried a variety of measures," Woodcock said in an interview. "We have to sort of walk that line: Where do we inform and where do we intervene by removing a drug from the market? That is a very draconian step. . . . And so, we do try to avoid that." Six specialists involved with the FDA's decisions concerning Propulsid said the volume of prescriptions for reflux in infants helped keep the drug on the market. One specialist who sought earlier withdrawal of Propulsid said, "If it were just the nocturnal heartburn indication we were considering . . . it's a pretty easy decision" to pull it off the market. Many alternative therapies existed, including over-the-counter products like Tums and Maalox and Zantac. Woodcock, who was appointed to her position 10 months after Propulsid was approved, said the FDA did not formally weigh the off-label use while deciding to keep the drug on the market. She acknowledged that it was prescribed widely for children but said she relied on pediatricians to make prudent decisions. "They're aware of the QT-prolongation issue," Woodcock said. "This isn't as if it's some mystery. . . . They evaluated this and came to their own conclusions about the risks." A spokesman for the Johnson & Johnson subsidiary, Greg Panico, said the company did not promote Propulsid for use by children. However, he acknowledged that it did make two "educational grants" to the North American Society for Pediatric Gastroenterology and Nutrition. The society's literature advised doctors that Propulsid could be used safely and effectively in children. Panico declined to say how much money the company provided; according to the society's Web site, the group has been "generously supported" by the Johnson & Johnson subsidiary. The society held a symposium on the use of Propulsid at an October 1998 conference in Orlando, Fla. A spokeswoman for the pediatric society said the company's grants came with "no strings attached." The removal that Woodcock and her aides negotiated this year allows the continued sale of Propulsid under a "limited access plan." This authorizes doctors to administer the drug to patients of all ages who have not benefited from other treatments and who would be closely monitored. In September, the British Medicines Control Agency rejected continued sales of Propulsid there under such conditions, saying, "Restricted-access schemes . . . are not adequate to protect public health." The British have warned since 1998 against any use of Propulsid in infants and cautioned against prescribing it to children up to age 12. For her part, Woodcock said she remains "concerned" about the drug's use among children. A recent agency review found that, while "no clear evidence" implicated Propulsid as the primary cause of eight children's deaths before the July 1993 approval, neither was there enough data to exclude a "role" for the drug in several of those cases. As for adult patients who died, Woodcock said, "It's a terrible thing to happen to somebody who is just taking the drug for heartburn." Panico said there remains a place for Propulsid. "When we made the decision to limit access to the drug, we had pleas from families of children who are taking this drug to make sure that these kids can have continued access to it," he said. "So, it's a balancing act."